"Good hotel with a great restaurant called indulge." Have a question for Sukhumvit Suites Hotel? "Hope next time will stay there again." "Location is very good within 5 mins walk to bts and t2"
When visiting Bangkok, you'll feel right at home at S Sukhumvit Suites Hotel, which offers quality accommodation and great service. Situated only 0.03 Km from the city center, guests are well located to enjoy the town's attractions and activities. A well-kempt environment and its proximity to Siam Emporium, Raja's International Custom Tailors, Sukumvit Plaza Korean Town give to this hotel a special charm. At S Sukhumvit Suites Hotel, every effort is made to make guests feel comfortable. To do so, the hotel provides the best in services and amenities. 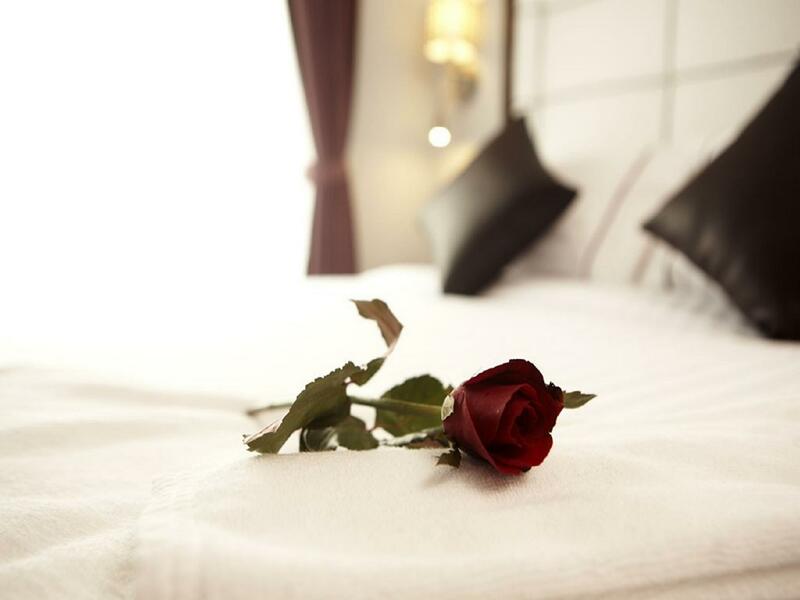 This hotel offers numerous on-site facilities to satisfy even the most discerning guest. Guests can choose from 75 rooms, all of which exude an atmosphere of total peace and harmony. Besides, the hotel's host of recreational offerings ensures you have plenty to do during your stay. 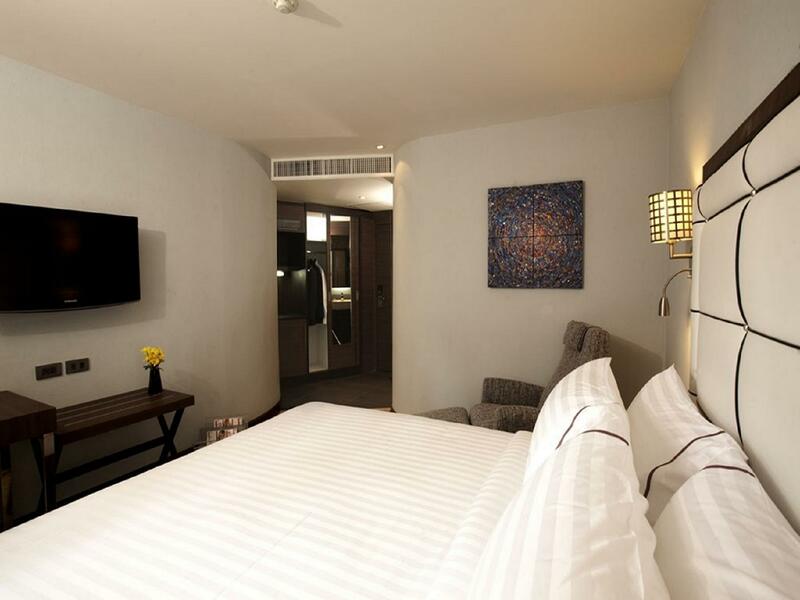 S Sukhumvit Suites Hotel is your one-stop destination for quality hotel accommodations in Bangkok. "Superb location - one traffic light away from shopping mall,..."
Su, the manager, helped my girlfriend give me a nice surprise on valentine’s day. Su was great to work with and is a very professional person. The other staff members and maid are great. The place is spotless and located near the BTS and MRT so you will not get caught in traffic. 5 minutes walk to one of the premium malls. absolutely pleasant stay here, even though the hotel front isn't very elaborate, the rooms are fanstastic and nicely done and clean. The location with the link bridge to the BTS and next to Terminal 21 also offers much convenience as well. This is a great location if you are mostly staying by the Nana, Soi Cowboy areas. BTS and MRT right across the street. Terminal 21 which is a fantastic mall across as well. Made a great launching point to other areas that are accessible by BTS + River Boat. Rooms are small but clean. Noise was about average, expected more considering the location. If you only have a day or two and want a location easily accessible to public transit, this is great choice. Great hotel for location, rooms are small but perfectly comfortable and onsite bar/restaurant very good. My only negative point is that the room cleaners make a lot of noise in the corridors outside the rooms from 8am which woke me up. But this wouldn’t stop me staying again. the location of this hotel is as central as it gets. 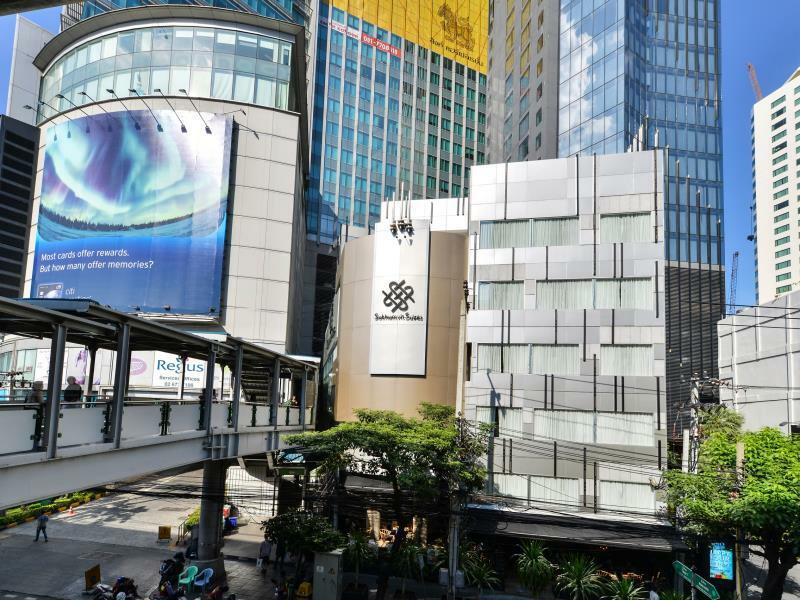 one of bangkok most busy intersections oppsite Bangkok's newest shopping malls. you can walk to the skytrain in under 5 minutes too. staff are very friendly. from the door man to the maid and reception they would always greet me with a smile and a hello. there isnt a pool but the restaurant on the ground level more than makes up for it. I found the restraunt to be one of the best in bangkok. The location is great. The price is good. They don't offer really any amenities. No pool and some rooms can be a little noisy. Overall good value. Would stay again. 7 Eleven and Food Mart both are very close. Laundry service off premise is very close. Across the street to Terminal 21 that should have everything you would ever need. Friendly staff. Small hotel hotel but adequate rooms good aircond and good shower. Location is very good. The restaurant downstairs Indulge was an excellent place to chill out good food and friendly wait staff. I will stay here again but the room rates were a little expensive when compared to bigger hotels for a few dollars more I could have stayed in a 5 star hotel. The S Sukhumvit Suites Hotel is in a perfect location. Right next to Asok BTS and within a short walk to whatever entertainment and food you may desire. My suite was roomy, comfortable and in proper order. I was hesitant at first because of reviews that mentioned a musty odor, and there was a hint of it, but as soon as the A/C ran for a while everything was fresh for the 4 days I was there. Every hotel I have stayed at in Thailand has not left the A/C running when the room isn't occupied. Learn how to adjust the control properly kick the blower speed up a notch or 2 and give the unit a chance to take the humidity out. Might take 30 min or more. The Staff was very helpful and friendly. I would like to give Aom and Muk and especially Nit a special mention for their excellent attention and care. It was always very appreciated. I will definitely return in the future. This hotel has very good location, below the hotel there is very nice restaurant where many expats having drink and chat. This hotel also has stairs to BTS Phromphong station. Next to the hotel is Terminal 21 shopping mall. The hotel is located close to Asok BTS which makes it very convenient for travelling. It is a short 3 min walk through the overhead bridge. It is very close to the Terminal 21 shopping centre which is again convenient for restaurant food, supermarkets, SIM cards and even a cinema :) Just around the corner is the famous Soi Cowboy. Great location, sheltered all the way from Asok station which is just a few minutes walk away. Clean, modern functional room, friendly and efficient staff. Rooms that's facing main road can get a little hot from the evening sun. Right at the Asok BTS Station makes it convenient for to/from the airport transport, plus for other locations in Bangkok. Room (superior) was a good size, even though was narrow therefore not a lot of room between end of bed and wall, bed was comfy, bathroom and shower good size. We only stayed the one night before catching flight home, therefore can’t comment on facilities, meals or bar. I’m sure would be a good place to stay whilst in Bangkok for longer. Stayed in the superior room four months ago. This time round we booked a deluxe room. Room was spacious but had a bit of smell, maybe from the aircon. Had a lot of room in the bathroom too as compared to the superior room. Love the location. BTS and MRT both nearby, so it's super convenient. The hotel is very near to bts, mrt train. Go to places very easy. If take grab also easy. My friends and I stay for 4 days 3 nights. Most of the time is taking BTS. last day, we took mrt and airport express to airport - 45 mins (each pax 51bahts).. Good exercise too.. Hope next time will stay there again. As others have said, the location is excellent. The room was quiet and quite comfortable. A couple bits of info: In my room (506) the "City View" was really "Side of a Building Five Meters Away View". I suspect that when they list they are required to select a view for the listing and the latter was not offered in the drop-down. The shower was warm enough but far from hot, if that is your preference as it is mine. The sink did eventually get delightfully hot - I rarely cannot just set the tap for full-hot when shaving but here I had to back it off just a bit. And, finally, a tip: Don't do the rating survey offered at check-out unless you want to give your email address, or perhaps that of an enemy, to unknown persons: I got about three quarters through and came to a page that allowed me to sign up for exciting offers. I found no way to get past it without entering an address, so the survey ended there and I handed the tablet back. Excellent location, a 2 minutes walk from Terminal 21 mall. The rooms itself were good for the price. No complaints here. The only gripe I had was the air conditioning wasn’t working properly. Turning it to a warmer temperature caused leaking from the roof and humidity to the point when moisture was dripping all over the room. There was no option to turn it off also. It was near both the BTS (Asok) and MRT (Sukhumvit) station. Terminal 21 was just above those stations. Other than location, nothing much to shout about. Just a place to go back to shower and have a good sleep. Room was really small. We thought it was pricey considering how tiny the room was - but it won us over in location.